Story : Born with the blessings of Sage Durvasu, Karna (N.T. Rama Rao) was sired by Suryadev and an unwed Kunti, who was compelled to abandon him. She subsequently went on to get married to Pandu and sire five other sons, Yudhister, Arjun (N.T. 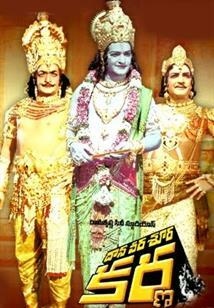 Rama Rao), Bhim, Nakul and Sahdev. Karna, in the meantime, was adopted by Adhiratha, a charioteer, and his wife, Radha, and grows up wanting to be a warrior. He is unable to find a Guru due to his birth, but does manage to acquire necessary skills from Suryadev, and obtain blessings from his new-found Guru, Parashuram. He will then go on to befriend Rajkumar Dhuryodhan, participate in the humiliation of Draupadi, and then take up arms against the Pandavas.